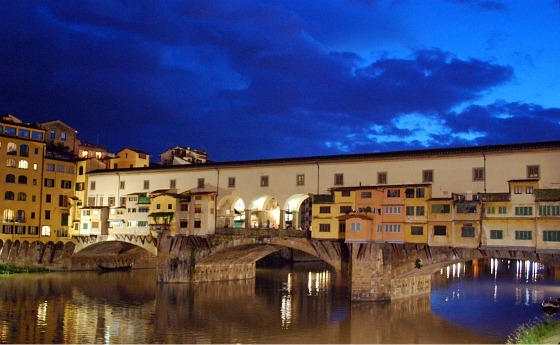 Ponte Vecchio in Florence is one of the world’s most famous bridges. The shops on both sides obscure the view of the river until you reach the central part of the bridge. As such, it’s easy to forget that you’re on a bridge until you reach this area. Originally, the shops on the bridge were butcher’s stalls, but today souvenirs and jewellery dominate what’s on offer. The bridge dates back to 1354, and running along the top is a secret passageway called the Vasari Corridor. It stretches from Palazzo Vecchio to Palazzo Pitti and allowed the Medici to travel from one to the other without entering a public street. The bridge spans the river Arno at its narrowest point and its believed that there has been a bridge of some sort in this location since Roman times. We really liked the bridge, but if you’re not planning to go into the shops, you’re not likely to spend very long here. Your visit will probably last only a few minutes to walk from one side to the other and take a few photos. Look out in the vicinity of the bridge for the recent craze of attaching padlocks to railings and chain fences. Lovers leave the locks as a sign of their bond for each other, often throwing the keys into the river and etching their initials on the locks. This practice is a constant source of irritation to the authorities though, who have to remove them from time to time. There are even signs warning of a fine if you’re caught doing it! 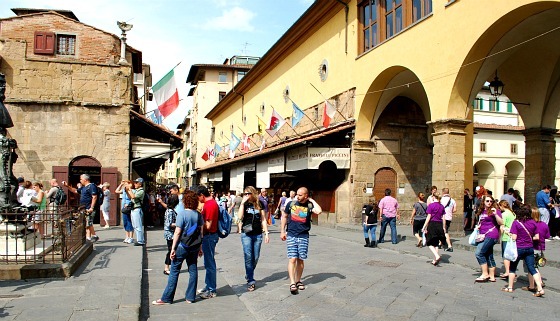 If you want to see the bridge on a tour, consider the Skip The Line Florence Walking Tour which calls in at Ponte Vecchio and consistantly gets good reviews from other travellers. Keep your hand on your valuables on the bridge as pick-pockets have been known to frequent it. There are usually municipal police officers around to keep them away though.